Friday, Chris and I spent the day up at the cabin working on the kitchen and the loft. It was the first time in months that we were there working with no contractors present. It was rejuvenating and motivating and the fact that we’re seeing so much progress is making our big goal of spending Christmas here feel attainable. And for the first time, after over a year of ownership, it felt like home. It’s a significant moment in any renovation, and for me it tends to happen far before you’re “done.” But definitely after a corner is turned. When you look around, you start seeing more of yourself and your influence around instead of all the things that feel foreign. And the new cabinets going in the kitchen (more on that tomorrow!) and the new carpet in the loft definitely pushed us into the this is ours territory. The door on the left is a small powder bathroom (so nice to have on this level!) and the door on the right is a closet. We decided we’d rather maximize the space for beds than have a closet up here, so we tore it out, clad the walls with pine that was around the closet (it’s amazing how that worked out!) and we were ready for the carpet installers to come! We love the carpet in our home so much, we knew we wanted to go with a two-toned Stainmaster carpet again. This time, we chose their Secret Dream line in the color Canvas (the sample in the top right in the photo below). It’s warm, but dark enough to hide traffic. Super soft and extremely kid and pet friendly–aka, cleans up like a dream. We love low-pile carpet, especially this two tone kind, because the pattern is made with the thread color so it’s never going away. To ensure it’s still just as comfortable to roll around on (we expect there to be a lot of that with the kids up here), we decided on the same pad that we used in our home, this high-performance memory foam Stainmaster carpet pad. It adds an extremely comfortable underlay to the carpet that we’d feel good about laying extra sleeping bags down on if need be. 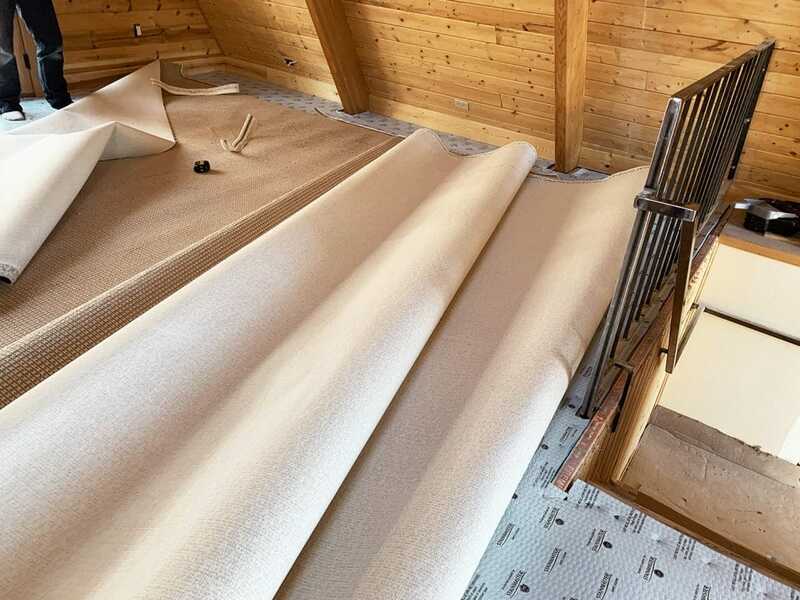 The carpet pad also promises to keep the carpet looking newer, reduces noise, insulates and extends the warranty. We left the installation to the pros. (They had to take off the railing for the fireplace stone and carpet install, but it’s going back on ASAP!). 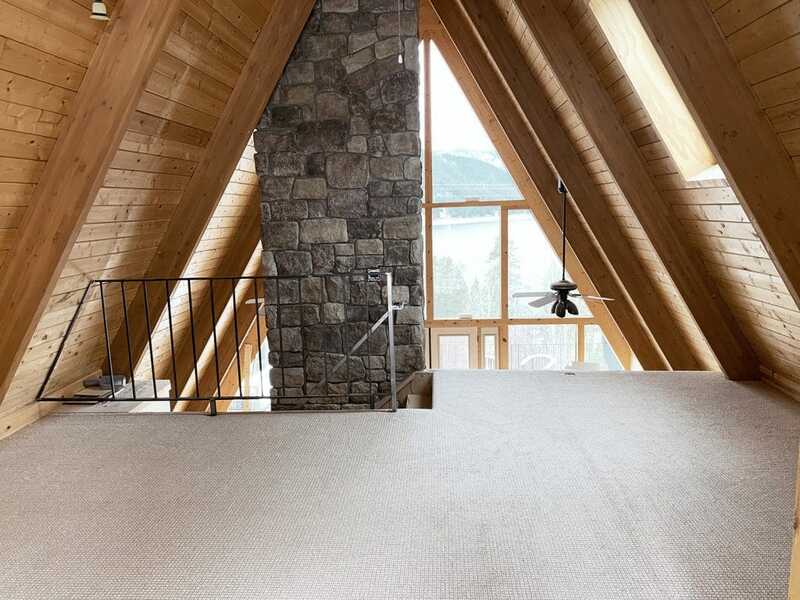 Wall-to-wall carpet sometimes gets a bad rap, but there’s nothing negative about this carpet. 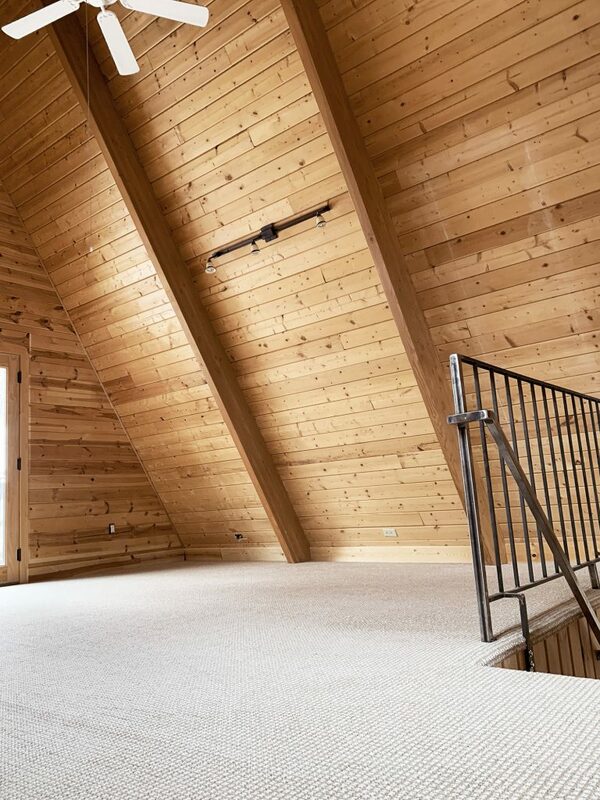 It’s beautiful, soft, fresh, modern and adds such a cozy layer to the loft. When choosing the color, we knew we wanted to go warm and neutral, but we also pulled tones from the stone in the fireplace and they coordinate so well. Above, you can see the closet gone! It feels so much more spacious and I’m so excited to share with you the sleeping situation for up here next week. I put together the beds on Friday and am so excited to start adding some cozy, cabin touches, too! There’s one seam that will gradually disappear as the carpet gets walked on. You can see it faintly at the front, left corner of the photo above, or below on the right third. I’m so impressed with how they matched the pattern there–it’s undetectable in person. The process from choosing a carpet to install was FAST! 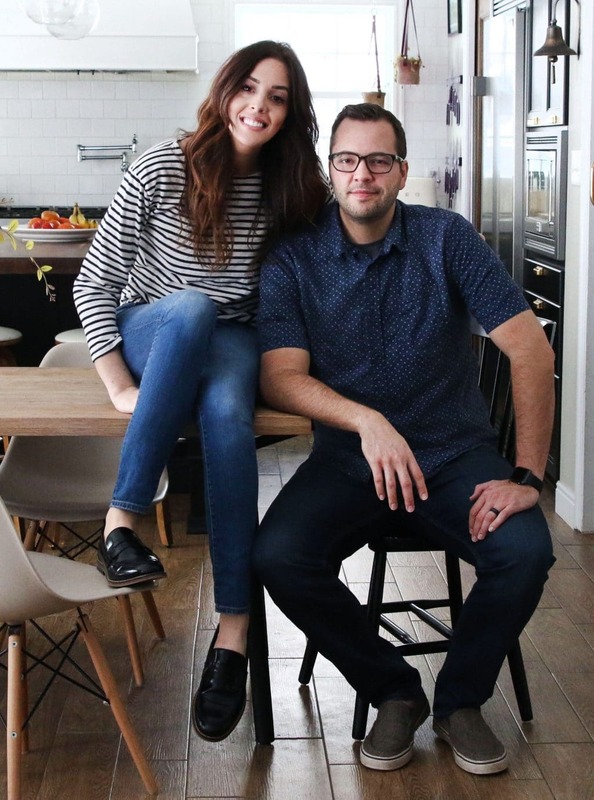 Stop by Lowe’s and pick up some carpet samples –we were able to take the sample board with us for free and I always recommend choosing the color of your carpet in the space that you’ll be laying it. Can’t wait to show you how this room comes together in the next few weeks! Installation services available thru independent contractors, licensed, & registered where applicable. License numbers & certifications held on or behalf of Lowe’s Home Centers, LLC. See Lowes.com/licensing for current license numbers. Where are the iron railings from? Do you have a fave place for this type? Love the cabin reno!!! These came with the cabin but look like they were formed together on site by someone with the skills to do it. What color is this? Love everything you do! I LOVE watching this come together! 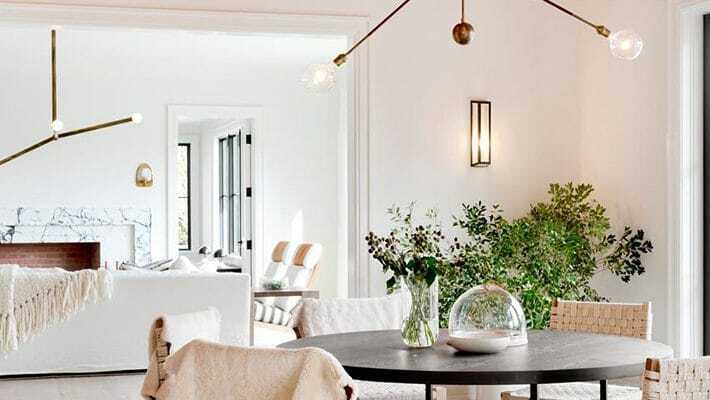 Such a fun and cozy space while still being very modern – bravo! I love the quality of the Stainmaster carpet, and we really considered it for our house. However, working with Lowe’s is a nightmare! Maybe it depends on what store you order from, but we’ve had nothing but trouble trying to get our place measured let alone order carpet. We’ve also had major issues with them ordering appliances, etc. and just had to eat the carpet deposit because we didn’t want to risk having them order/install 2500 sq ft worth of carpet. I see your comment of putting that railing back up and it is needed. But if it were me, I’d be looking for some sort of clear acrylic so the view would be the same. I think it looks so chic! The girls will experience such magical years up there. Are you going to put some type of railing on the ledge? Gives me major anxiety looking at it and thinking of your little ones! I know it looks so good open with that amazing view but kind of unsafe, no? I’m sure it’ll be safe no matter what you do! Congratulations though! Loving the updates! Wonderful find! 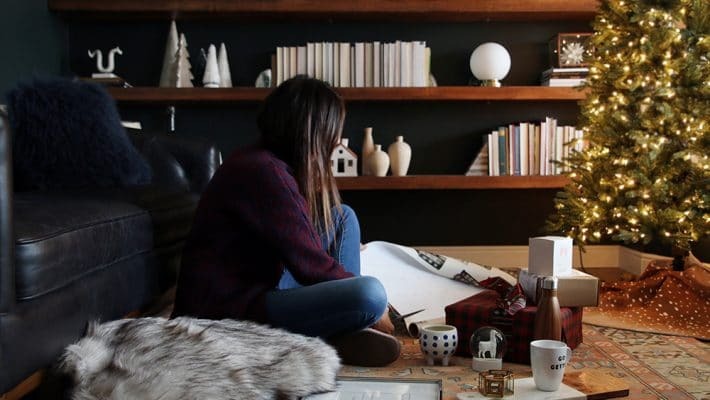 Love your picks for the cabin! This is so nice and cozy! It looks so good! I know you have been questioning whether to stain the wood paneling throughout the cabin but I really do love it as is! !’ Question: are you going to add paneling to the top of the powder bath? I think it would look so much better if it was integrated into the angle of the slant instead of looking like a box attached to a triangle? Either way, I’m so excited to see this space come together! Last night I told Chris that I really love the natural wood, so I think we’re going to leave it be! The new wall that they put up in the dining room had me questioning things for a bit, but I know it will age like the others have, or we could always try to stain it to hurry along the project. 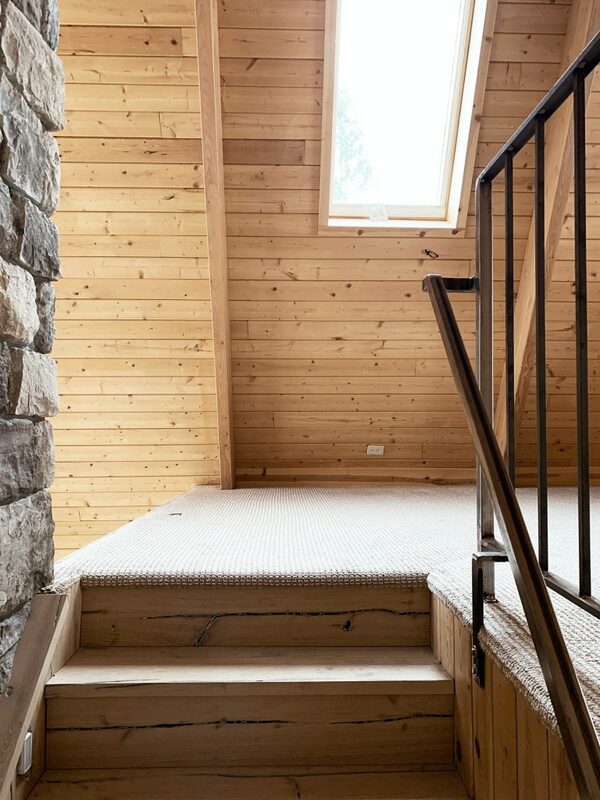 We haven’t really talked about it yet, because we’re still mapping out plans, but we want to put a crow’s nest above the powder bath in the loft! Wouldn’t that be so fun!? Thank you Julia for sharing. I love this space and think it will so much fun for the children to hang out in as they grow up. I love following along as you work through the updates at the cabin. The new carpet looks great in the loft. We have a similar color in our family room. One of the pics showed your shoes on the carpet. Are you generally a “shoes on” or “shoes off in the house” type of household? 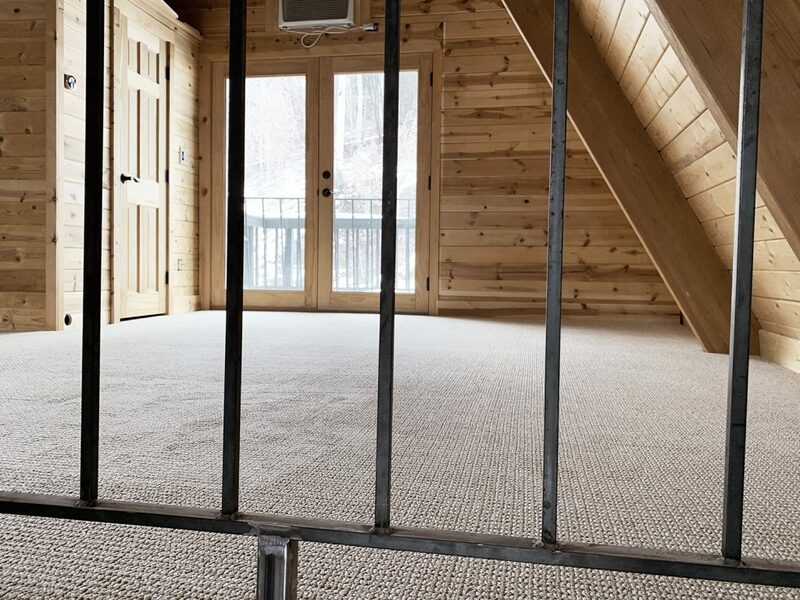 If on, how do you keep the carpet clean in the winter and snow? We are generally a shoes off family! However, with all the construction going on, right now shoes on in the cabin. I cannot wait to see how this shapes up! <3 It's going to be such an amazing space for your kids! 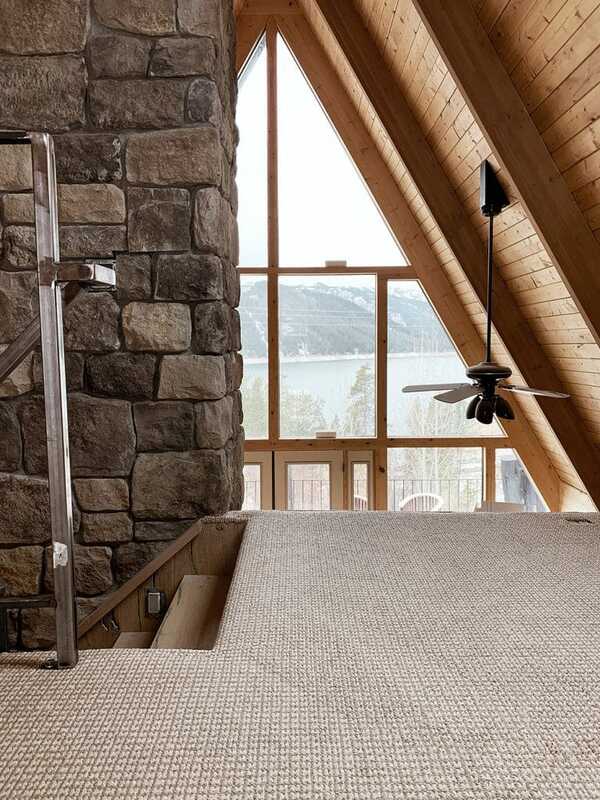 We’re actually just now starting to pick carpet for our master bedroom remodel, so really appreciate this post! My husband really prefers low pile carpet, and I do love the subtle pattern this one has! Always get samples! 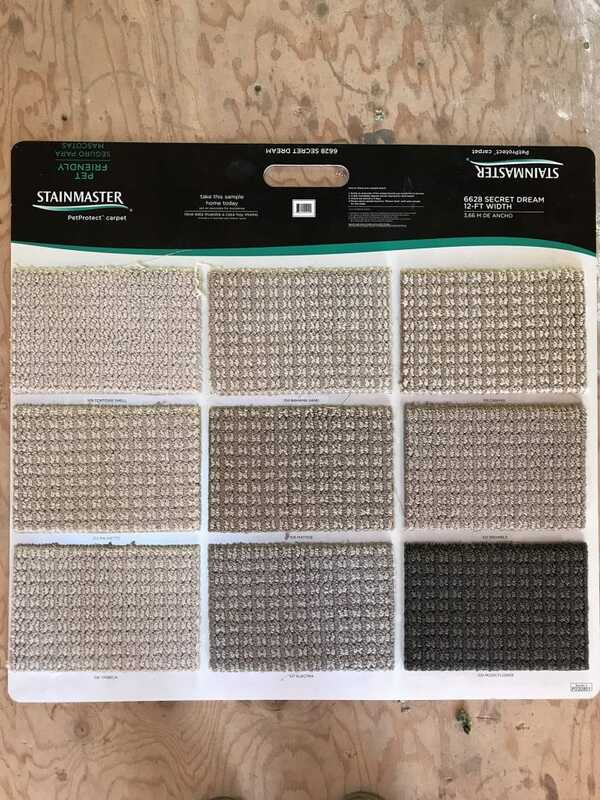 We were able to take the sample board with us to the cabin for free and I highly recommend choosing the color of the carpet in the space it is going to be in. I’m so jealous that you’ve had two great experiences with wall to wall patterned carpet with Lowe’s. Our carpet install last winter was a complete nightmare (We were hoping to install the same carpet as your basement). It must really depend on the area you live and the quality of installers? I wish your crew did work in MN! I agree.This carpet is like asking a painter to do patterned wallpaper.I would stress to the Lowe’s salesperson to put a note on your order stressing that at least one installation team needs to have had experience with low pile pattern carpet, especially if it will be installed on stairs.When Lowrs calls to confirm the install date STRESS it again. Removing the closet was such a good decision! I’m so in love with this space. 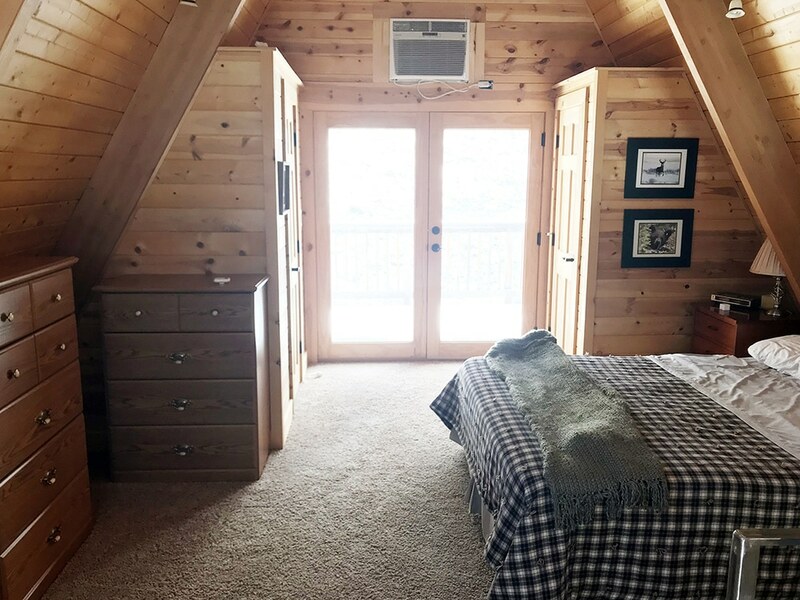 As a kid, I spent summers at my aunt/uncle’s cabin up at a lake and we had a loft space where all us smaller kiddos stayed and it was so fun. We were never bothered by any noise down below either – kids sleep through anything!